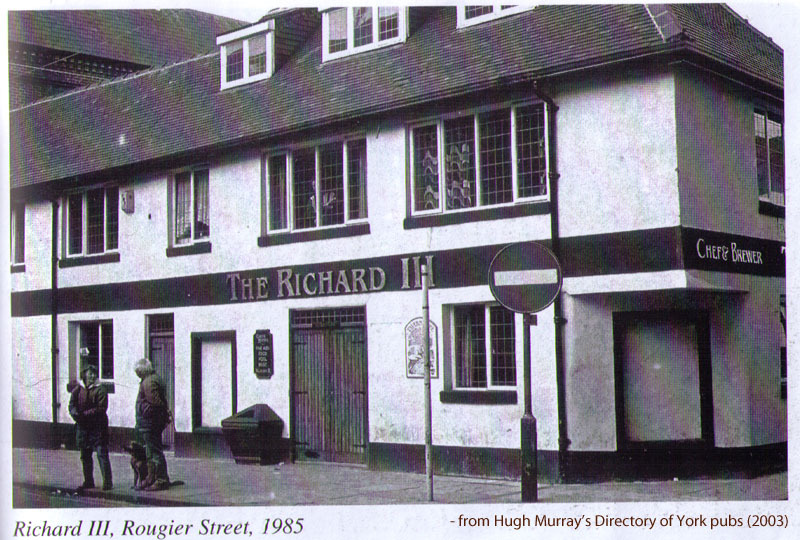 I have to say that with one honourable exception (see footnote) references to this pub were the only time I heard Richard III mentioned in York, until 2013, when it all ‘kicked off’. I realised the Minster had become a focus of attention, and as I wasn’t particularly familiar with this period in our history I went looking for facts, and tried to find some clarity in a mess of myth and misunderstanding. As the subject is in the news again because of the recent judicial review, I’d like to reflect on some aspects of the last twelve months or so since the reburial row began. The reactions and representations mainly, rather than the big question itself. Suddenly, in 2013, the city was being presented as the king’s ‘true home’. 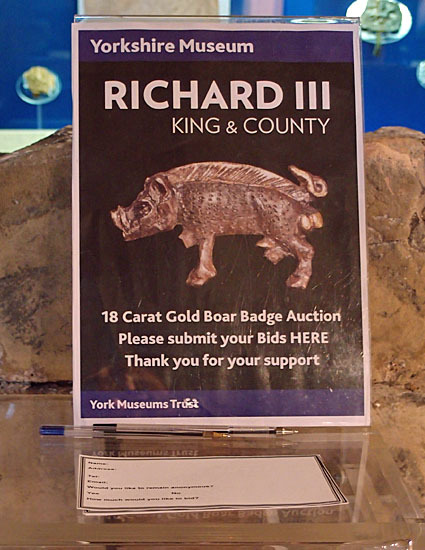 York has decades of experience in promoting its history, and our tourism and heritage industry sprang into action to demonstrate the city’s links to Richard III. There were exhibitions, a whole new website, and walking tours. 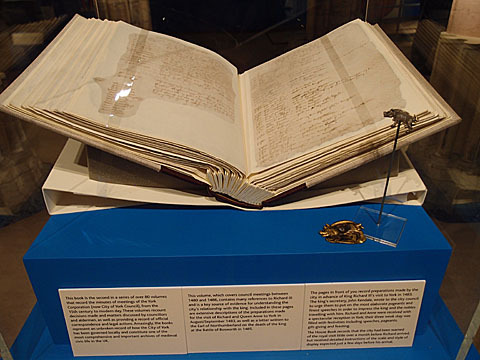 In online comments Leicester was accused frequently of being greedy, of wanting to ‘cash in’, but it was in York that the chance to handle a rare jewel with a vague Richard III connection was offered only to those who had a spare fifty quid. At least those responses seemed (on the whole) creative and educational. 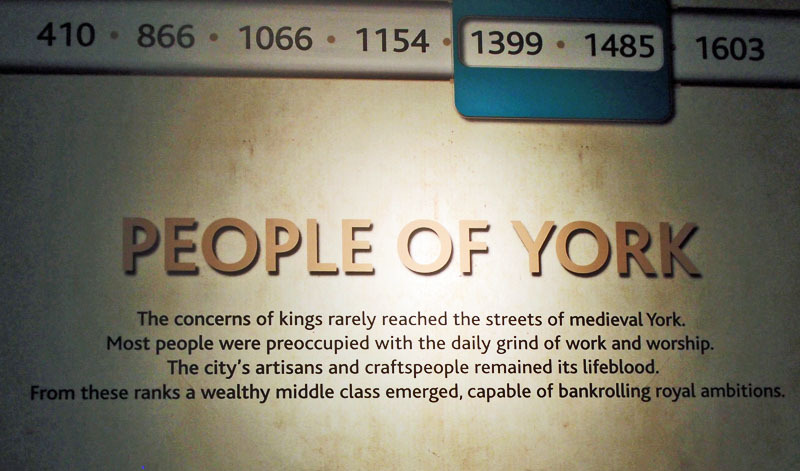 Whereas the first stumblings into the subject by City of York Council and our MPs embarrassed many York citizens. The Council had posters printed supporting the petition to bring the remains to York Minster, ‘to honour the living wishes‘, they said, confidently. We now know that there was no such evidence of this wish, that it’s all open to interpretation, but it wasn’t long before the internet was full of it, romanticised often into references to ‘his dying wish’. Julian Sturdy proclaimed in a debate that ‘the call is strong from the great county of Yorkshire’. Actually I thought the call from Leicester was much stronger, if you bothered to investigate how Leicester already commemorated and celebrated its links with Richard III. These seemed long-running and well-established. As a York born-and-bred person with a website about York and Yorkshire maintained for ten years I hope it’s obvious that I have deep roots here and that I care deeply about the place and its history. I also care about misrepresentation, and I particularly care when our elected representatives claim to speak for ‘York’ and get it so wrong. The e-petition signatures were presented by Hugh Bayley MP and others as some kind of reflection of local opinion. The truth was more complicated, as previously discussed. Many of the people wanting to send the king’s remains to York didn’t live anywhere near York, as the available postcode data shows. Interesting to observe how the e-petition system was used and viewed in this whole RIII debate. The petitions on the government site are meant to be there for the purpose of gathering enough signatures to give the petition a chance of being debated in Parliament. 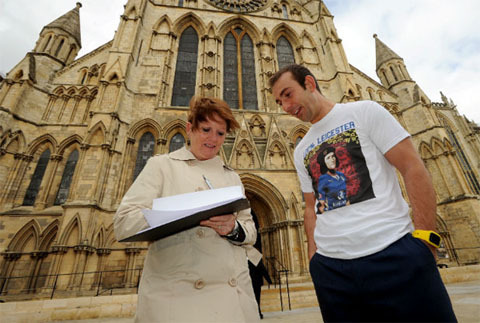 Neither the pro-York nor the pro-Leicester petition would get anywhere near the 100,000 signatures necessary. That seemed irrelevant, as ‘York’ and ‘Leicester’ went head to head, in a race the pro-Leicester petition ultimately ‘won’ (34,477 signatures against the pro-York 31,349). I’m still wondering, after so much money, time and effort has gone into the Leicester plans, how it could work, or would work, here in York, should the pro-York campaigners be successful. 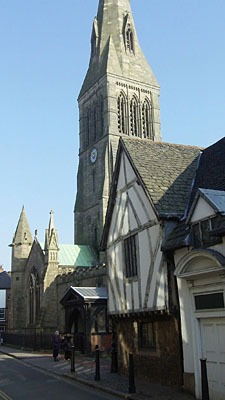 It has been difficult enough to get a plan together for a Leicester reburial, and that’s a relatively modern building. No one has been buried in York Minster since the 19th century. We’re now in the 21st century, with very strict rules about what you can do with the fabric of ancient buildings like York Minster. The Minster looks big and empty because of various repavings, but under its floor are loads of bodies. We can’t just dig them up and shift them out of the way because we need to fit in a king. Or maybe we can. But we’ll probably have further arguments about that. It could go on for years yet. The talk of York Minster burials has reminded me of William Etty – whose statue stands in Exhibition Square. Etty was a true ‘son of York’. Born here, he cared deeply about the city, and was a high profile voice in the campaign to save its walls from destruction. He wanted to be buried in York Minster. But was he? No. 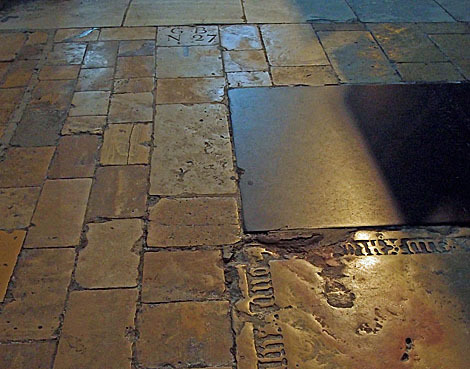 He was put in a tomb in the graveyard of St Olave’s, near the arches of St Mary’s Abbey, his ‘dying wish’ unfulfilled. 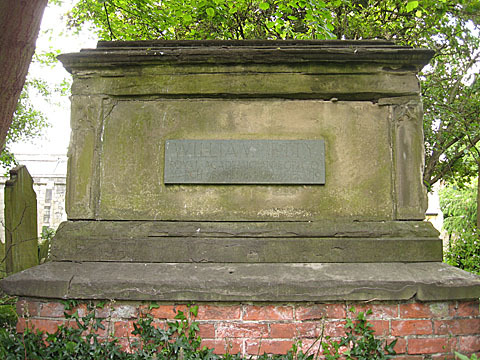 For the generations coming after, it does at least mean that if we want to see his tomb we can easily do so, for free, whenever the Museum Gardens are open, rather than paying the entrance fee to York Minster. Thousands of words have been written on this ‘reburial row’. I think I ended up reading most of them. The best article I’ve seen, the one I was cheered and amused by, was in the Leicester Mercury, and involved a visit to York by two of its reporters. They dashed through the city, cheekily presenting the ‘pro-Leicester’ petition to people they met. In autumn 2013 I visited the Richard III exhibition in the Yorkshire Museum. I dashed in, late in the day, York Card in hand. My enquiry as to which part of the building this particular exhibition was in brought the response that they no longer had the head, in an apologetic tone, as if I might find this news disappointing. I said I hadn’t come to see the head, I’d come to see The Book. Actually I was a bit tired of seeing that head, that recreated ‘how he would have looked’ head. I saw it on every article about Richard III, every blog posting, everywhere. I’d not felt a need to visit The Head. But I did want to see The Book. And what a beautiful thing it is. 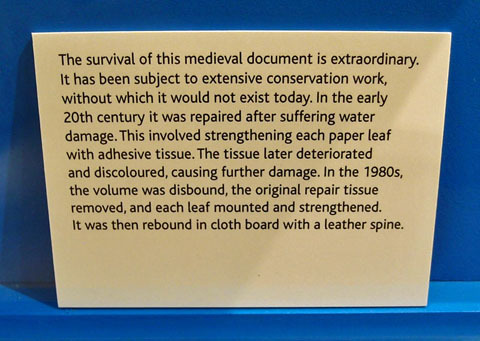 The most impressive aspect of it is described in the explanatory text, pictured here, detailing the skill and care involved in preserving this fragile document. Worth going just to see that. 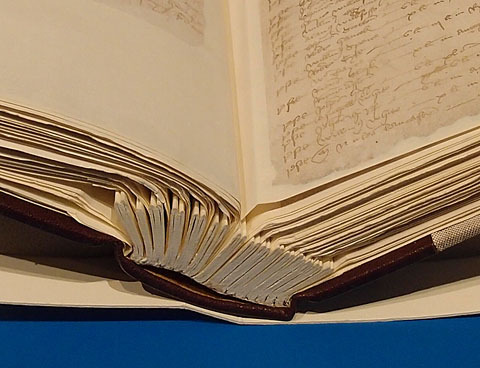 It’s still there, now open on the page recording Richard III’s death. Remove the ‘and worship’ and the word ‘medieval’ and it’s just the same today, isn’t it. love the R3 museum..sneered at by some Ricardians as amateurish but a real labour of love.. Its a safe bet Richard wouldnt want to be buried in a city that mocked and reviled him post Bosworth.I support any petition to get him back North despite lack of York postcode. as a lifelong resident of York, the matter of the burial is, as far as i can tell, a matter of supreme indifference to the vast majority of the people who live in York. the claim that he is a “much loved son” is rubbish. i do not believe that the Plantegenot Alliance can speak for the relatives of Richard III, surely by now there are, at a minimum, 100’000s of ‘relatives’, have they polled them all? or just the ones who thought it was important to trace back their ancestory and join up? there’s no clear indication of where he wanted to be buried. and even if there was, i was unaware that we always bury people where they wanted when they died in battle. i can think if millions of exceptions to this. and i’m fairy sure he didnt want to die in battle.. we dont always get what we want in life, or death..
this whole affair is undignifying, time-consuming and expensive..
although i commend you for still maintaining an interest! The ignorant campaign to bring Richard III’s remains to York is driven by twisted history, baseless claims, fatuous emotionalism and ugly partisanship. It is important that this nonsense is challenged. Thank you York Stories for sticking with it and doing the job so well. I don’t really want to be drawn in to the reburial row again, having seen how energy-draining and nasty some of the online discussion has been. I wanted only to make some observations. If individuals or groups want to campaign for a York Minster burial then that’s up to them – having now heard some more thoughtful views put forward I do have more understanding of the ‘pro-York’ feeling. What I found objectionable was the way our elected representatives jumped on the bandwagon and spoke for ‘York’, when clearly they weren’t. I’m really more interested in the lives of we ordinary non-royals, in more recent history, so I’m running off back to the 1970s, where I feel more comfortable. I’m glad this page is of interest though, been trying to get it written since last autumn, when the Leicester Mercury piece appeared. I have been following you for a long time now (that sounds weird haha), and feel I must comment on here now. You are correct, it’s not a battle of cities; the press picked up on that and it seems to have stuck. As you rightly point out, the epetition shows most signatories do not reside in York, but are spread all over the country, and signatories of the global petition are worldwide. There will be people in York who would love Richard in their fine city, also there will be those who either don’t want him/don’t care. I am a big supporter of Richard being interred in York Minster. The reason for this is because all the available evidence suggests he was planning for his and his family’s interment there. Richard may not be a ‘much loved Son of York’ nowadays, but he certainly was in his lifetime. I would like to think we can fulfil a man’s wish, thinking not of ourselves, but a former King of England, and give him a little piece of the Magnificent York Minster.